United recorded a single shot during the first half but Jose Mourinho's men came from behind to lead after the interval thanks to a brace from Anthony Martial. 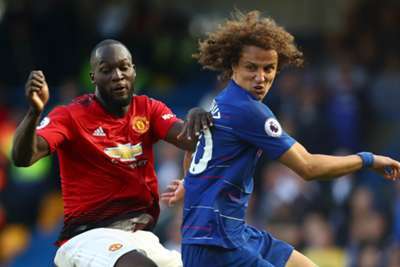 Barkley's late impact prompted a fracas on the touchline but the result leaves Chelsea third in the table, two points behind leaders Liverpool and Manchester City. And David Luiz, who played under Mourinho during the Portuguese manager's time in charge at Stamford Bridge, hit out at United's tactics. "We tried to win from the beginning of the game," the Brazil defender told Chelsea's website. "We controlled the game with possession, trying to create some space to score some goals. They came with a plan just to defend and play on the counter-attack. "I think in the first half it was just us who played. We could have done better by scoring the second goal to kill the game, but it is never easy to win in the Premier League, especially against a big opponent. "It gave them a chance because we had only scored one goal and in the second half they came and scored a lucky goal with the ball touching a player and bouncing about. "After they scored they had a bit more confidence, and it was a great game. This is the Premier League against fantastic teams, so we have to keep going and try to work hard." "Even though we were 2-1 down, we kept trying to score the equaliser and we did that in the end so I think the spirit was amazing," he added. "This was a big game against a big club, and it is always like this. We have to realise we had amazing spirit to try and score the second goal and we did that in the end. "We are happy we have gone this many games without losing, but we are keeping on working hard to try and improve our team because it is just the beginning."